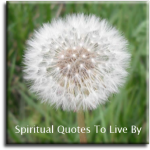 The encouragement quotes on this page are all from authors with surnames D to F. You can find more positive words of encouragement and motivation on the A to C, G to L, M to R, S to Z pages and also the Sayings from Unknown Sources. I began to realize how important it was to be an enthusiast in life. He taught me that if you are interested in something, no matter what it is, go at it at full speed ahead. Embrace it with both arms, hug it, love it and above all become passionate about it. Lukewarm is no good. Hot is no good either. White hot and passionate is the only thing to be. It is most unlikely. But.. Here comes the big ‘but’.. not impossible. Never do anything by halves if you want to get away with it. Be outrageous. Go the whole hog. Make sure everything you do is so completely crazy it’s unbelievable. You’ll never get anywhere if you go about what-iffing like that. Would Columbus have discovered America if he’d said “What if I sink on the way over?” “What if I meet pirates?” “What if I never come back?” He wouldn’t even have started. Do not fear mistakes.. There are none. 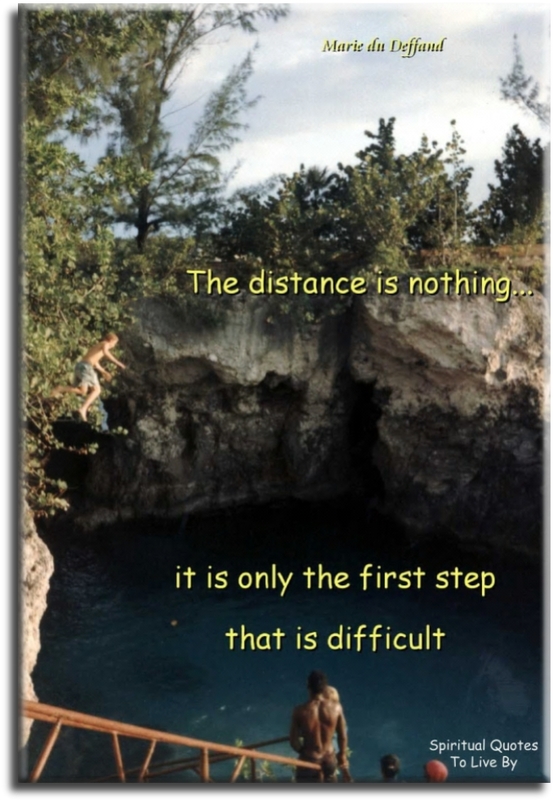 The distance is nothing, it is only the first step that is difficult. I believe my eyes were closed to help others see their own true potential. My mother once told me, when you have to make a decision, imagine the person you want to become someday. Ask yourself, what would that person do? Anything you want to succeed in, you can do. Doing what you love is the cornerstone of having success in your life. Don't die with your music still in you. If you believe it will work out, you'll see opportunities, if you believe it won't work you will see obstacles. If you would like to accomplish something you must first expect it from yourself. Listen to your inner knowing. Make yourself available for success, and know and trust in an invisible force that’s all-providing. The qualities of creativity and genius are within you, awaiting your decision to match up with the power of intention. 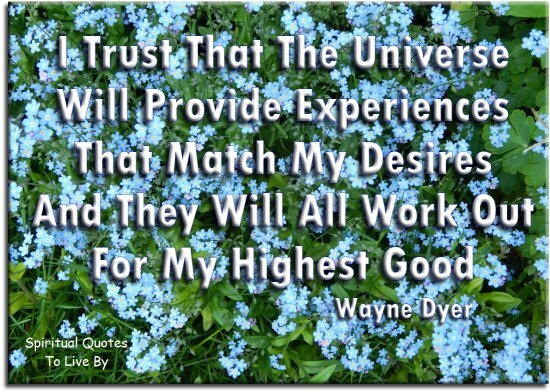 When you become certain that nothing is impossible for you, you'll attain everything you desire. With everything that has happened to you, you can either feel sorry for yourself, or treat what has happened as a gift. 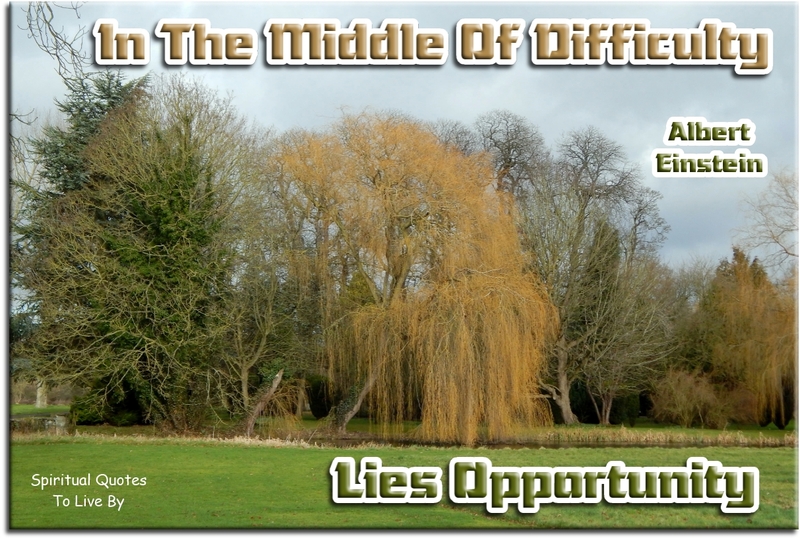 Everything is either an opportunity to grow, or an obstacle to keep from growing. You get to choose. Some of the best lessons we ever learn we learn from our mistakes and failures. The error of the past is the wisdom and success of the future. I think for months and months, ninety nine times the conclusion is false. The hundredth time, I am right. No problem can be solved in the same consciousness that was used to create it. Three rules of work: out of clutter find simplicity, from discord find harmony, in the middle of difficulty lies opportunity. No one can defeat us unless we first defeat ourselves. The sun is my totem. It reminds me that I am a child of light, a Being capable of powerful positive energy. On my darker days it's also a reminder that no matter how difficult this moment may be, the sun always returns to banish the shadows and light the way. By focusing on what we can learn from our challenges and how we use them to add value to the lives of others, we can turn any adversity into an advantage. Make bold moves toward your dreams each day, refuse to stop and nothing can stop you. 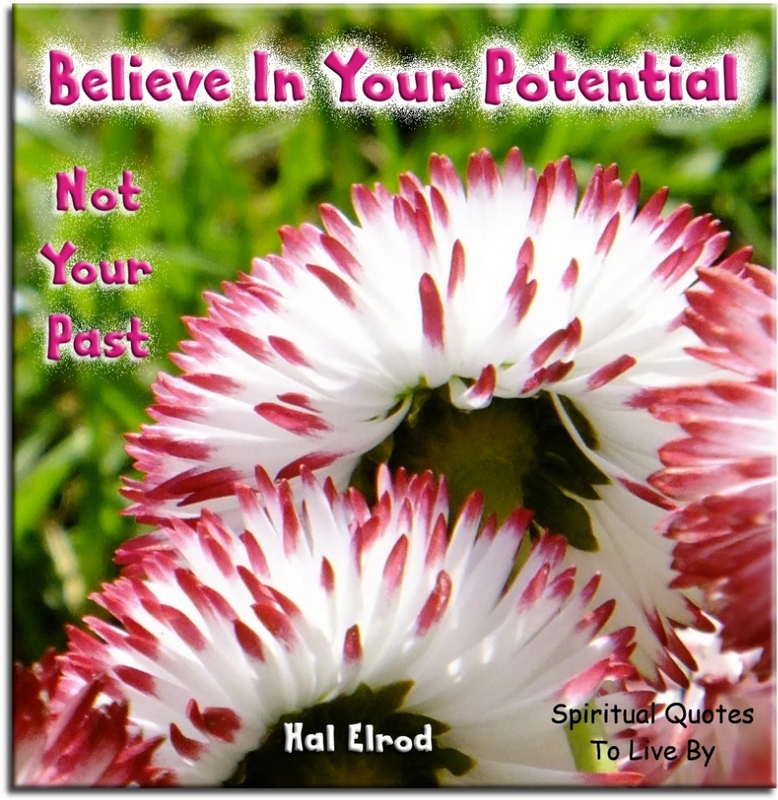 Our level of success is always going to parallel our level of personal development. Do the thing... And you will know the way. The number one cause of unfulfilled potential is never deciding that NOW matters more than any other time in your life. There is nothing to fear, because you cannot fail... only learn, grow and become better than you've ever been before. You must establish and maintain the beliefs that you are capable, committed and destined to achieve your goals. If a man write a better book, preach a better sermon, or makes a better mouse trap than his neighbour, tho' he build his house in the woods, the world will make a beaten path to his door. Trust and instinct to the end, even though you can give no reason. Onwards… with your hearts wrapped in the arms of Angels. Success is about being able to extend love to people. Not in a big capital letter sense, but in the every day, little by little, task by task, gesture by gesture, word by word. Enthusiasm is the yeast that makes your hopes shine to the stars. Enthusiasm is the sparkle in your eyes, the swing in your gait, the grip of your hand, the irresistible surge of will and energy to execute your ideas. It makes no difference how deeply seated may be the trouble, how hopeless the outlook, how muddled the tangle, how great the mistake. A sufficient realization of love will dissolve it all. If only you could love enough you would be the happiest and most powerful being in the world. Acceptance doesn't mean resignation. It means understanding that something is what it is and there's got to be a way through it. When I begin a story at my desk, the window to my back, the path is not there. As I start to walk, I make the path. The thankful heart sees the best part of every situation. It sees problems and weaknesses as opportunities, struggles as refining tools, and sinners as saints in progress. Even if you have a ton of competitors, no one else will do it quite like you. The difference between a dreamer and a doer is the amount of action that follows their vision. With each and every client you help, you change the world. Challenge yourself; it’s the only path which leads to growth. I shall become a master in this art only after a great deal of practice. How often I found where I should be going only by setting out for somewhere else.